Students from Whitstable Community College have won the Stage Makers inter-school competition. The competition ran for three months and included teams from Abbey School, St Anselms and Community College Whitstable. The participating students were given a brief to design a building within their school site which could be used for performances. 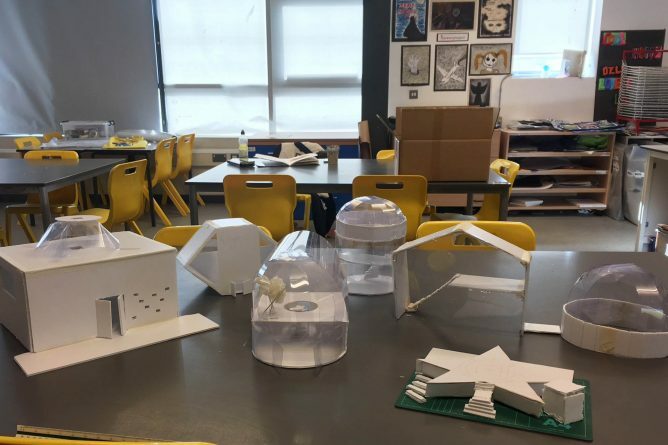 Ambassadors from Kent School of Architecture led 5 workshops within each school and provided the students with materials for designing and model making. After introducing students to plans, sections and elevations, it was over to each group to decide what space they wanted to make for their school. There were certain things that the space had to include: a green room, WC and shower, storage, a stage and a space in which the audience would sit or stand. On Thursday 3rd April, students, parents and staff were invited to Kent School of Architecture for an afternoon of activities and a presentation of prizes. 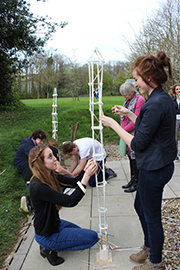 Fine artist Patrick Crouch and the KSA ambassadors took the visiting students outside in the sunshine to design and build towers with some very impressive results. 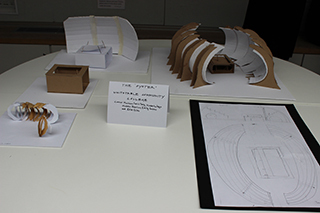 The competition models were displayed in the Digital Crit Space which is where the judging took place. All the judges agreed that the Year 9 students from Community College Whitstable were the winners with their model – The Oyster. Academic lead Rebecca Hobbs said: ‘All the pupils from the participating schools showed a great level of commitment and each group came up with some lovely ideas. The winning team used the oyster shell to generate the form of their stage. They encouraged and supported each other throughout the five workshop sessions. They worked together to produce a simple and elegant scheme illustrating their thought process in a very mature way’. All students were presented with a Stage Makers sketch book and have been offered a place on the Architecture Summer School which is happening in July. The winners each received a copy of Phyllis Richardson’s influential book Big Ideas, Small Buildings and the afternoon ended with refreshments and a tour of the school. Sonya Connell from Community College Whitstable commented: ‘The students thoroughly enjoyed the process working alongside the University staff and the student ambassadors and are thrilled to have won the competition. It was very interesting to see the University in action and the students really enjoyed seeing the work of the architects that they had been working with. The students are really looking forward to the Summer School and we are happy to support the project again next year’. Mary Woodfine from Abbey School said: ‘Our students really enjoyed the workshops and meeting the ambassadors. Problem solving and team working skills came to the fore but over everything else the students really enjoyed the experience and as a result, are considering both the Summer School and Architecture as an option’. We are looking forward to seeing the students again in July for the Summer School and would like to thank them again for taking part in our first Stage Makers competition.